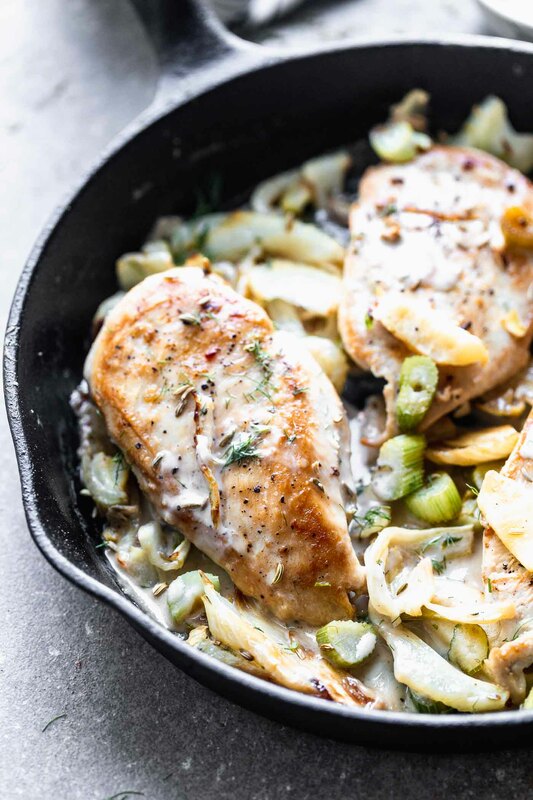 Chicken with Roasted Fennel and Apple Brandy Cream Sauce is an easy weeknight dinner that’s a total showstopper! 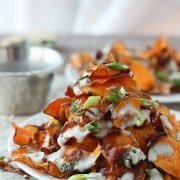 Perfect for those days when you’re in a complete dinner rut. If you’ve ever said chicken is boring, then I assure you, you haven’t met today’s Chicken with Roasted Fennel and Apple Brandy Cream Sauce. 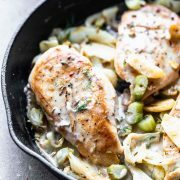 That is, unless you think perfectly seared, juicy chicken breasts blanketed in an apple brandy and fennel seed-infused cream sauce, and tossed with caramelized apples and roasted fennel that’s almost as sweet as candy, is boring. Have you ever roasted fennel before?? It’s absolutely delicious. 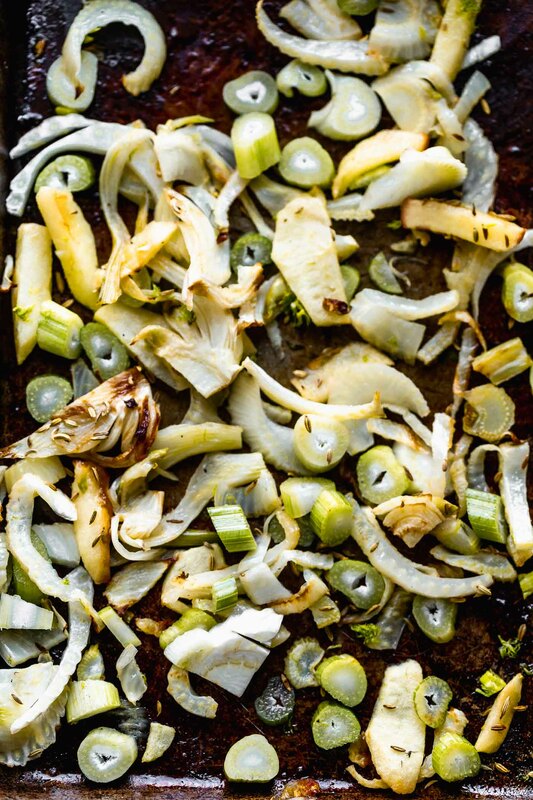 I never used to be a fan of fennel…until I roasted it. The strong anise taste fennel innately has when it’s raw, breaks down into a much more subtle, sweet flavor during the roasting process. I’d sort of equate to the way a caramelized onion tastes, in that it takes on an almost candy-like essence in the end that I find it to be completely addictive. 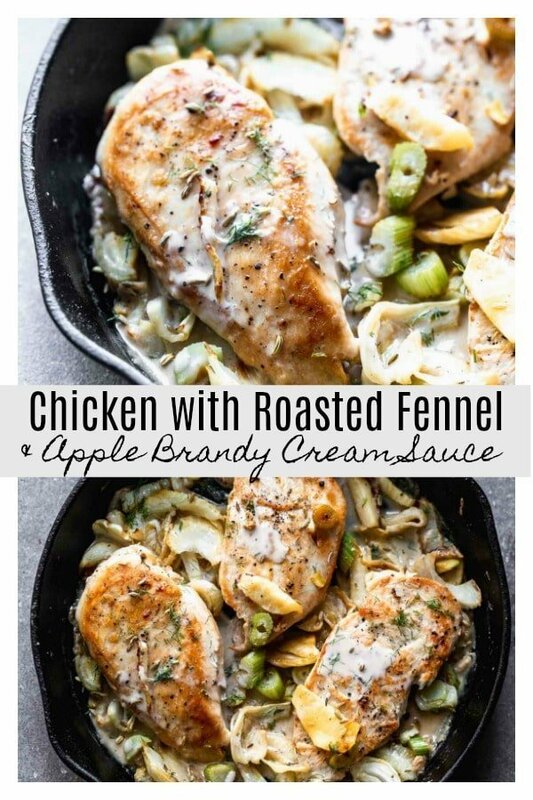 I have no problem eating it as is, straight from the roasting pan, but since fennel seems to have a magic friendship with apples, I found it to be the perfect duo to round out this chicken dish. Roasted the fennel and apples is as easy as slicing the fennel and apples, tossing them with a little bit of olive oil, plenty of fennel seeds (to compliment the fresh fennel), a touch of black pepper, and of course, plenty of salt. The veggies are popped into a 375 degree oven, and cooked until they’re juuust starting to caramelize and soften. 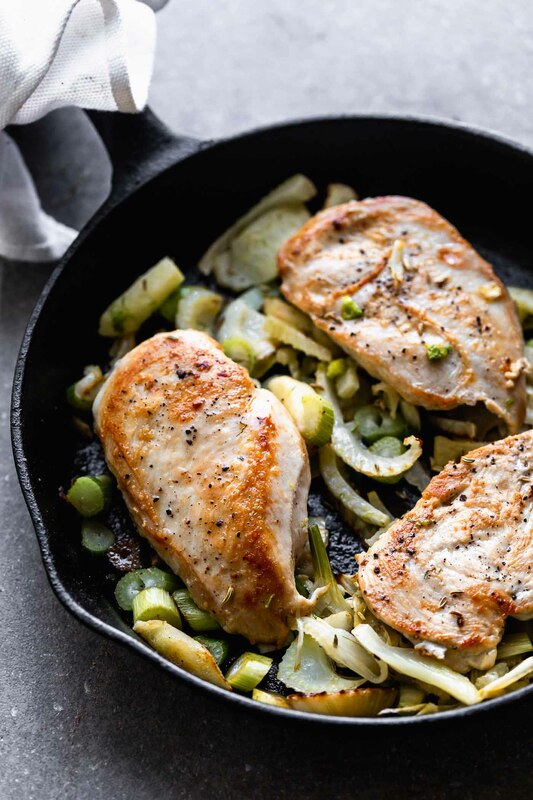 In the meantime, season the chicken breasts with lots of salt and pepper and sear them in a super hot, well-seasoned cast-iron skillet. Because chicken takes longer than the 2-3 minutes per side it takes to cook them all the way through, I like to pull the veggies out just shy of completion, and sprinkle them amongst the partially cooked chicken breasts. The whole thing goes back into the oven until the chicken is cooked through, and the veggies are perfectly soft and sweet. It’s about five more minutes, give or take a minute or two. There’s the sauce. The sweet, savory, creamy sauce, so good, you’ll be licking the plate clean after the chicken and vegetables have disappeared. There are very few ingredients in the sauce — calvados (apple brandy), cream, fennel seeds, salt and pepper — which may lead you to think it’s one-note, but it’s not, trust me. If you’ve never cooked with calvados, you’re in for a treat. 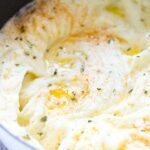 With only one ingredient, you something simple, like a cream sauce, to a sweet, unique new level that feels really special. Plus, you can use the leftovers to make this Apple Brandy and Whiskey cocktail I’m currently obsessed with. 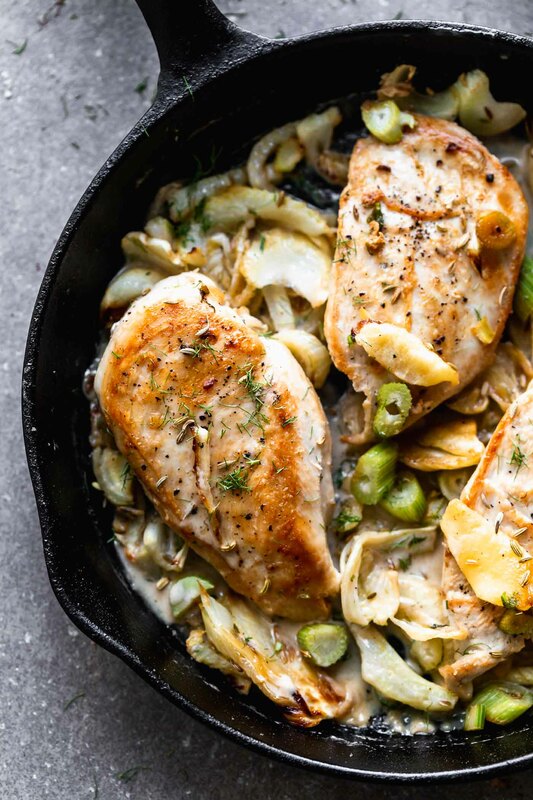 Once the chicken is done cooking, you pull the pan out of the oven, transfer the chicken and veggies to a plate to rest, and make the sauce directly in the hot pan. Use the calvados to deglaze the skillet, and pick up all of those awesome brown bits that stuck to the bottom of the pan in the cooking process. Once the calvados is reduced, add in the cream, salt and pepper. Simmer the sauce until thick and luscious, then put the vegetables and chicken back in for another minute or so. I also like to chop up the wispy fronds of the fennel as garnish, it’s just another way to add another element of the fennel into the dish, plus it’s pretty. 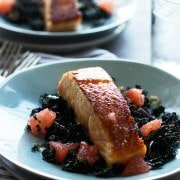 Serve over a bed of creamy orzo, simple quinoa, or a big bed of sautéed spinach. You can use any kind of apple brandy, or if you can’t find it, regular brandy. Granny Smith, honey crispy, any kind of apple will work! If you can’t find small chicken breasts, buy large ones and cut in half lengthwise. You now have two small breasts. This also works with pork chops or any hearty fish. Just adjust cooking time as needed. I am veggie obsessed, so I like to double the fennel and apples on occasion. Half and half or milk won’t work, stick with cream! 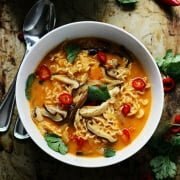 For more easy chicken dinners, check out these posts! 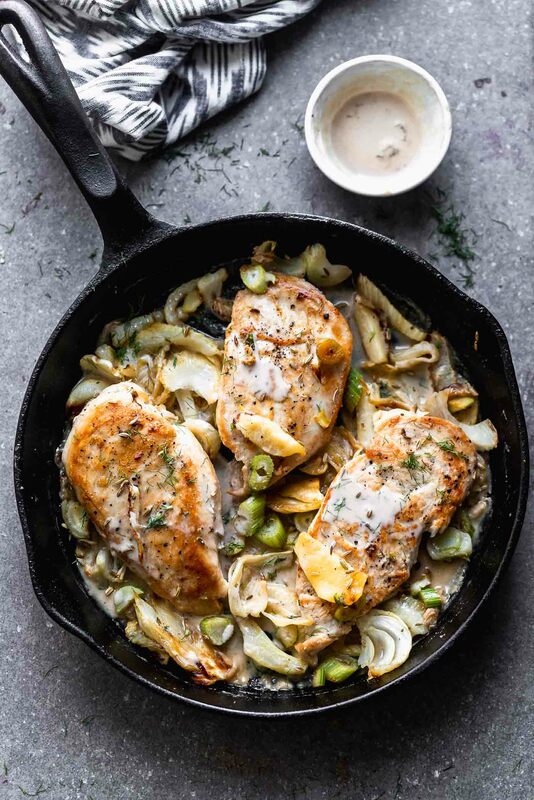 Chicken with Roasted Fennel and Apple Brandy Cream Sauce is an easy weeknight dinner that's a total showstopper! 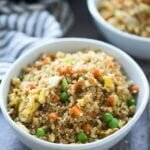 Perfect for those days when you're in a complete dinner rut! Slice fennel in half. (I like to leave the core in since we're roasting but you can take it out if you want.) Lay the fennel cut-side down on a cutting board. Slice the fennel into 1/4-inch slices, all the way up to the fronds (the leafy part of the fennel). Finely chop the fronds. Add the cut fennel, minus the fronds, and apples to a medium bowl (You can also do this directly on the pan if you don't want to dirty up another dish). Toss with one tablespoon of olive oil. Add fennel seeds, pinch of sugar, 1/2 teaspoon salt, and black pepper. Toss until evenly coasted. Spread onto a large baking sheet and roast for 12 minutes or until they vegetables start to caramelize and soften. While the veggies cook, season chicken breasts liberally with salt and pepper on both sides. (I usually use about 1 teaspoon of salt per pound of chicken, and about 1/4 teaspoon black pepper per pound.) 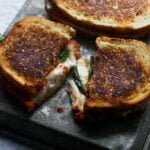 Heat a large cast iron skillet to a medium heat. Add remaining 1 tablespoon olive oil. Once the oil is hot, add chicken. Sear until golden brown and crusty on both sides, about 3-4 minutes per side. Remove veggies from the oven, and sprinkle around chicken breasts. Place back in the oven and roast until chicken is cooked through and fennel and apples are soft and sweet, about 5 more minutes. Transfer chicken, fennel and apples to a plate to rest, cover with foil. Return the cast iron skillet to the stove and heat over a medium flame or burner. Add calvados. Use a wooden spoon to scrape up all the brown bits at the bottom of the pan. Simmer until reduced by about half, about 2-3 minutes. Add cream, remaining salt and sugar. Reduce heat to medium-low and simmer until cream has thickened, about 2-3 minutes. Season to taste with salt and pepper. Add chicken, fennel and apples back to the pan. Serve with sauce, fennel and apples spooned on top and around chicken. Garnish with fennel fronds. 4 Responses to "Chicken with Roasted Fennel and Apple Brandy Cream Sauce"
So glad you liked it Sabrina! You say the cuisine is American, but it bears all the signs of being from Normandy (Calvados, apples, the cream sauce).